Creating your own invites and goodie bags for birthdays is so easy and economical. Plus, if you have a helper, they can make the production line move a bit quicker. We’re going to start by making our own patterned paper. 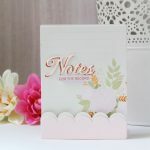 Creating your own patterned paper using dies as stamps is a fun way to mix it up! This card is actually quite easily reproduced. 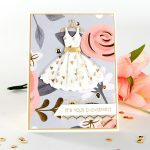 Start with your card base, a few dies, ink, and cardstock and you are set. To create the background, I die cut the party word from fun foam 4 times. (This is the 2mm foam). Adhere them on your block. Stamp them using removable adhesive. You could just cut one, but this took far less time, and less lining up. After stamping twice, half you card is done! *Bonus Tip! After cutting out letters or numbers to create words, line them up on your mat spaced how you want them on your project. Place a piece of removable tape (or washi) over them to hold into position. You can then pick them up and use whatever liquid adhesive on the backside to place them on to your project while keeping them lined up. The bags are simple, adhere a red strip of cardstock, and the same focal piece from the card. I added the #TY. That’s Thank You for those that don’t have tween children speaking in hash tags at home. AJ lives in the beautiful Pacific Northwest with her husband, two children, and two dogs. 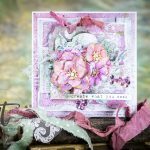 She has been scrapbooking since her son was born, and has since branched into cards and other crafts as well. She spends most of her down time time at the soccer field supporting her daughters’ team, and is lucky enough to be able to work from home creating. She loves coffee, mint chocolate anything, and enjoys cooking as well as baking.